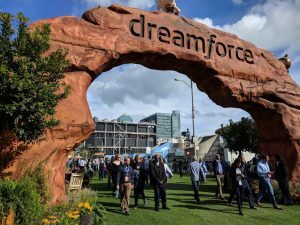 Dreamforce 2017 was my first Dreamforce. 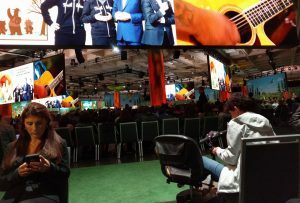 I had been to other Salesforce events, but even the World Tour in New York City paled in comparison. Nonetheless, I was as close to prepared for the craziness as I could be. I set out on Monday morning determined to get the most out of my time there. I wasn’t quite sure how it was going to go seeing as the campus, yes campus, covered numerous city blocks. Heck, there was even a road closed down and covered with AstroTurf to create a relaxing oasis. But I let determination be my guide, that and some careful planning. This is a city block…seriously. There was even a climbing wall, hammocks, and Adirondack chairs. Before heading out to San Francisco, I had looked around for resources on navigating this conference with a disability. There wasn’t much. No blogs or other resources. Sure, I found the basic information that Salesforce provides. But it wasn’t much. And by the end of the week, I realized I should have taken advantage of the place to request assistance during registration. It would have made it easier to connect with the AbilityForce folks. This could have reduced my time waiting in line and getting to seating. Now I know and so do you. Don’t hesitate to register your needs with Salesforce. The campus was enormous. One of the highlights of Dreamforce was hearing Michelle Obama speak. The line was long… really long. Back to that whole “should have self-identified”. Luckily, once I was inside the conference center, I ran into someone from AbilityForce and I was directed to accessible seating where I was joined by a Salesforce employee who is deaf, two other individuals who are blind, another woman who used a wheelchair, and two ASL interpreters who translated the entire speech. It truly emphasized how accessible Salesforce really is; how much the company strives to for equality. In fact, Salesforce has been called out as a great option for those with disabilities or chronic illnesses in The Mighty. So I couldn’t actually see the stage, but it was still inspirational. In the Trailhead Zone, this conglomeration of admin, developer, and user resources with a waterfall, trees, and thousands of people, I found the holy grail of accessibility. Multiple booths showcased the design aspects within the platform. One was specifically focused on the accessibility of Salesforce but the others were also prepared to continue the discussion within the theme of their booth. Guess what? They have an entire team at Salesforce devoted to accessibility. Use a screen reader? Check, Salesforce is accessible. Use an alternative mouse or keyboard, also accessible. What about needing high contrast? Well there could be some improvement there. I spent a while talking with the UI and accessibility folks about the changes needed. They demoed how a new feature that is coming will let you customize the colors. If your logo colors aren’t accessible, the system will provide you with similar alternatives that are. I was in love.